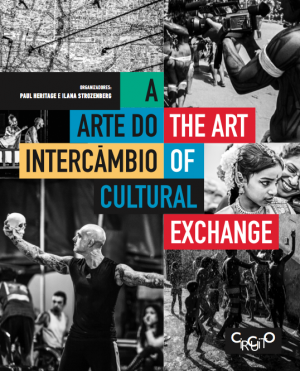 The book TACE – The Art of Cultural Interchange is the result of an academic research of two years of the same name developed collaboratively between the Queen Mary University of London and the Federal University of Rio de Janeiro. Cultural exchange is an important means by which nations and communities translate themselves and are in turn translated by others. The Art of Cultural Exchange proposes an investigation into cultural exchange as an act of translation. It will focus on the transformations sought through the exchange of artists, arts production and artistic methodologies. The research project asks what happens when artists translate ideas and practices from one cultural context to another: what gets lost and what gets learned in the adaptation? How are those who make the translations themselves transformed? How mutual is the act of translation and how sustainable is the process of transformation? If translation is, as is often said, a betrayal, then how do we understand and evaluate the importance of the gaps and losses that open up during the process? Funded by the Arts and Humanities Research Council, in partnership with the British Council and the support of Arts Council England. A mapping of the diverse mechanisms of UK/Brazilian cultural exchange programmes undertaken between 2012-16, analysing their defining features and identifying through interviews with key stake-holders the opportunities, risks and challenges in achieving declared goals. Six case-studies of collaborative artistic exchange projects that are being implemented between 2012-16. The case studies will focus on how the exchanges look to mediate differences and translate the diversity of social backgrounds and cultural expressions. Special attention will be given to exchanges that contribute to producing and disseminating social technology innovations that transform the city landscape and the lives of their residents. Two interdisciplinary seminar forums (UK and Brazil) with academics, artists, young participants, activists, producers and policy makers directly engaged in diverse aspects of cultural exchange. The commissioning of four position papers from across a range of disciplines to reflect on key issues arising from cultural exchange as translation, to provoke and brief the seminars. A project website to host the results of the mapping exercise, publish progress reports and audio-visual documentation on the six case-studies, and provide online publication of the position papers and reports from the forum discussions.